Before you complete your user profile (and sometimes even after) you may find that WordPress will display your username instead of your full name in the bylines of your stories.You can edit your user profile at any time by logging into your site and then clicking on your name (or username) at the very top right corner of the dashboard. When you edit your profile you'll want to fill out at least the First Name and Last Name fields and then you'll be able to select from the "display name publicly as" dropdown menu the format you'd like WordPress to use to display your name to your site's visitors (in bylines, etc.). To edit another user's profile (assuming you have sufficient permissions), you can click on the Users menu item in the left navigation of the WordPress dashboard and then select the user you would like to edit by clicking on their name. Tip: If an author has either a prefix, suffix, more than two names, etc. that you'd like to display, you can simply use the First Name and Last Name fields but add more than one name or prefixes/suffixes to the boxes. 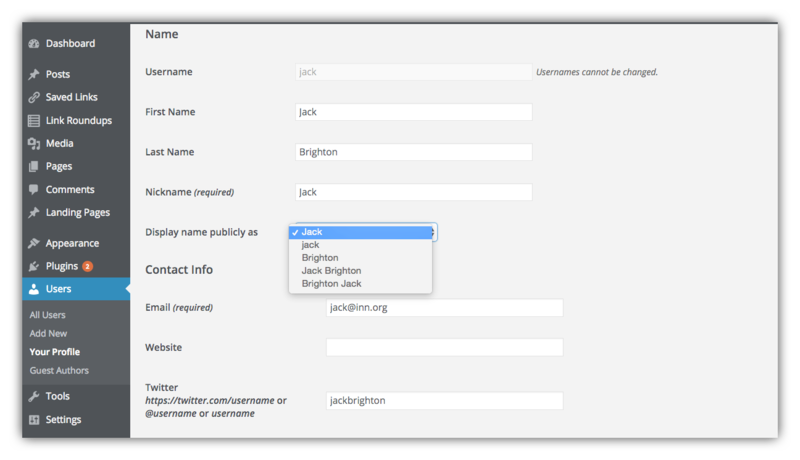 So you might have "Dr. John Jacob" as the First Name and "Jingleheimer Smith, Sr." as the Last Name to get the display name dropdown to allow you to display the full name as you'd expect.